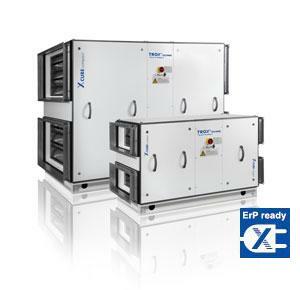 With the X-CUBE compact TROX has created a ready-to-operate and pre-configured air handling unit that combines the excellent features of the X-CUBE in the smallest of spaces. These units handle volume flow rates of 600 to 6,000 m³/h and offer a heat recovery efficiency of over 80 % (dry, to EN 308), hence they are the ideal solution for small and midrange applications. Energy-efficient plug fans with EC motor ensure maximum efficiency and low sound power levels. can easily be connected to the X-CUBE control system.